I received these items from PacSafe for review. All opinions are entirely my own. Whether you’re traveling to a far away country or sightseeing locally, nothing can ruin an otherwise lovely trip like having your your laptop, camera, phone, money, passport or other valuables stolen. Our family loves to travel and in doing so we try to take proper precautions. However, even otherwise safe areas aren’t immune to theft. 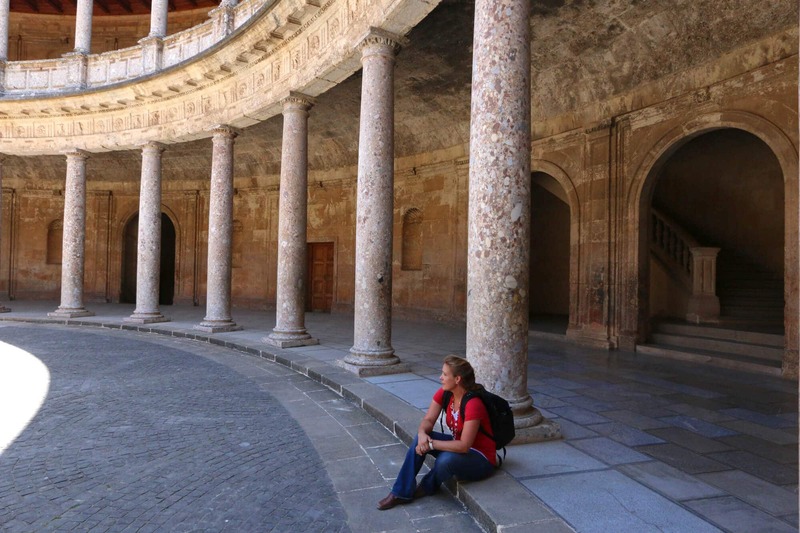 For example, we recently toured Spain and one of our stops included Barcelona, an otherwise safe city. However, it’s one of the pickpocket capitals of the world. That’s a problem common to most major cities, whether it’s Paris, London or New York. And you can even fall victim in quaint, quiet villages where there’s a thief with an opportunity. We like to be prepared wherever we travel and so we recently turned to Pacsafe to gear up. In business for going on 20 years, Pacsafe was founded by two avid Aussie travelers who had toured more than 80 countries around the world. Their mission became one of creating quality, innovate, practical and comfortable travel gear that would keep travelers one step ahead of opportunistic thieves and give them the peace of mind to fully enjoy their adventures. With their unique award-winning, anti-theft technology, Pacsafe continues to evolve their technology and designs. Today, Pacsafe products are available in over 33 countries and their product line includes adventure backpacks, leisure bags, urban bags, women’s bags, camera bags as well as luggage and travel accessories. On a couple of recent trips we had the opportunity of testing several Pacsafe products. 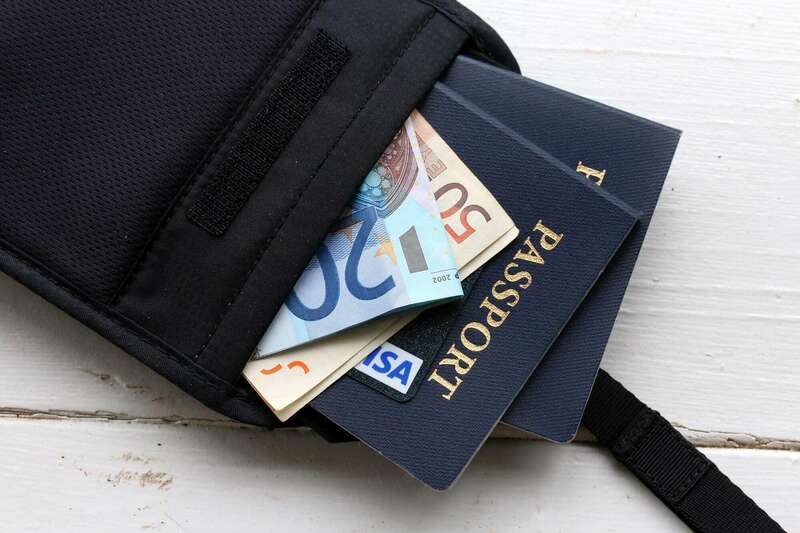 Keeping your money and passports safe is paramount on any trip. 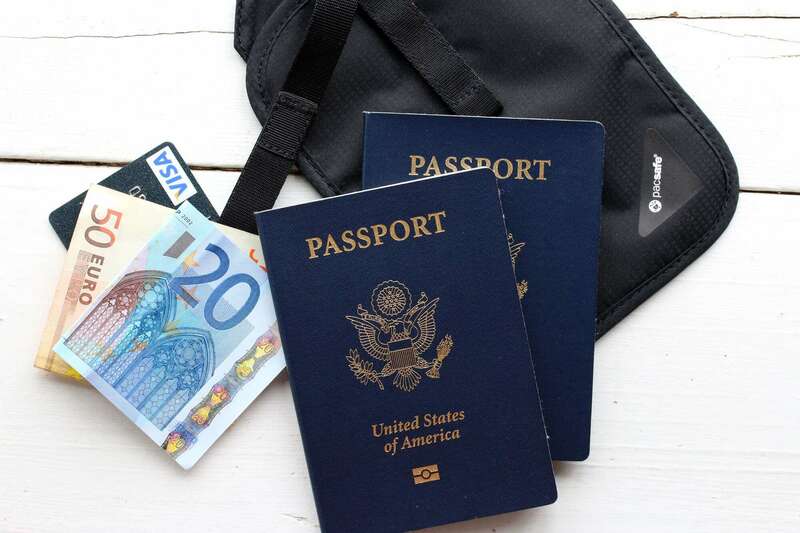 Though Pacsafe also makes purses and backpacks that are slash-proof and made with RFID blocking material, for times when you want to go out unencumbered by a bag, or for that added bit of safety, a belt wallet is perfect. The Coversafe V60 RFID Blocking Secret Belt Wallet fits that bill. Not only is it hidden from view keeping your cash, credit cards, passports, travel documents, keys or other small items safe, it’s also made with RFID blocking material to help protect against ID and credit card hacker scanning. Made of 100% breathable polyester it has soft webbing straps for extra comfort, comes with a Velcro flap closure and secures easily to a belt or belt loop. On excursions where one of us carried a Pacsafe backpack, the other still wore this belt wallet so we could divide up our cash between the two just to take extra precaution. With airport security having been upped in recent years, it’s not unlikely to pick up your luggage from the conveyor belt to find that your lock has been cut off and discarded to allow a search-through of your belongings. And once that lock is removed your luggage is then susceptible to other fingers searching through your luggage as well. The best solution is to use a lock that only airport security than open – and then lock again once they’re done. We’ve been using the Prosafe 1000 TSA Accepted Combination Lock for each of our bags. Made of steel, weighing 2.5 ounces and measuring 3″ x 1.24″, the Prosafe 1000 is Travel Sentry approved for the U.S., Canada, UK, Austria, Finland, Germany, Israel, Japan, South Korea, Netherlands and Switzerland. 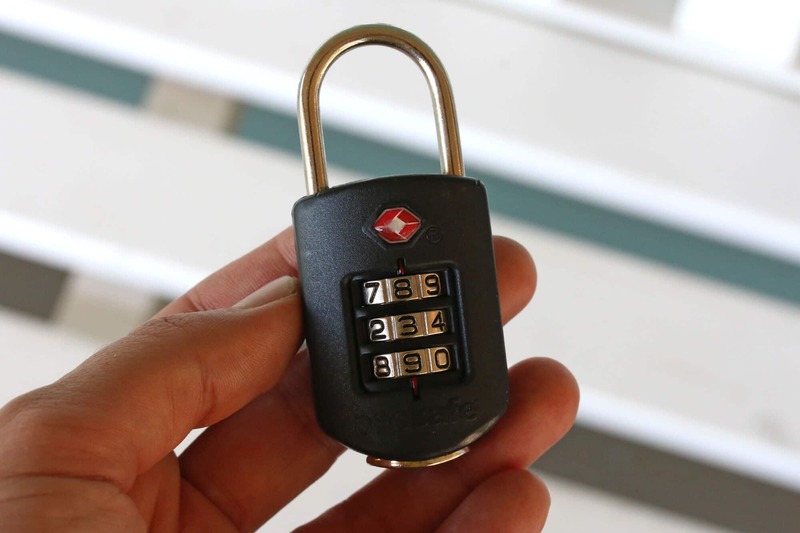 It comes with a 3-dial combination lock with a deadbolt locking mechanism and is easy to set and use. 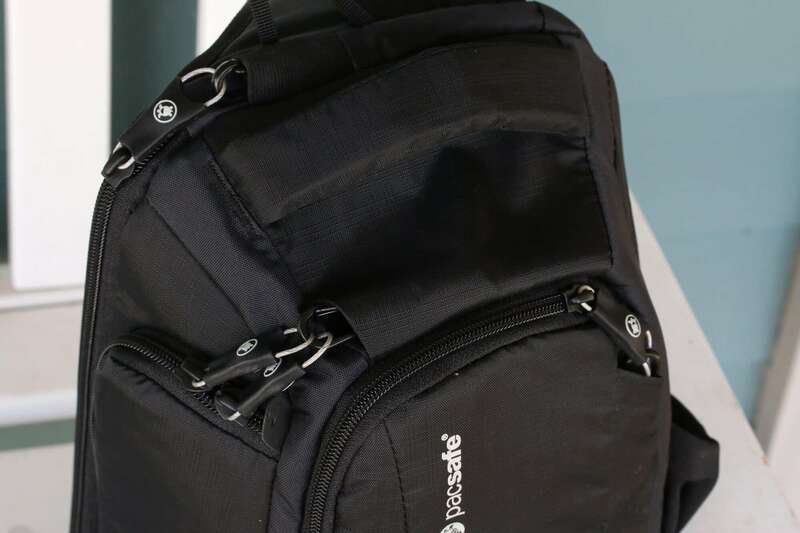 Pacsafe’s slings, bags and backpacks are simply awesome. They’re lightweight and comfortable with a durable build, lots of pockets and compartments, and equipped with theft-proof technology to keep your belongings safe. I was looking for a sling-style camera bag for when I’m on the go and don’t need to take a ton of equipment with me. 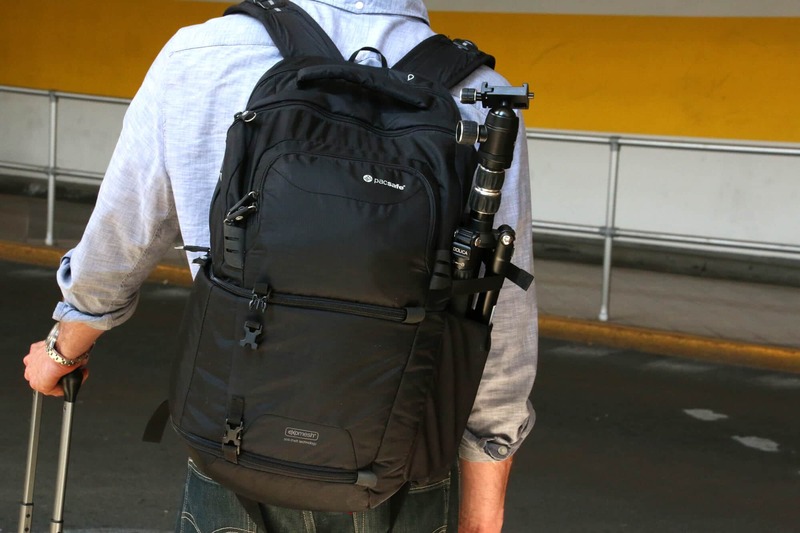 I really like the Camsafe V9 Anti-Theft Camera Sling Pack. The sling style of the bag enables you to access your camera with ease without having to remove the bag: Simply swing the bag from the back to the front, zip open the pouch and pull out your camera to start shooting. 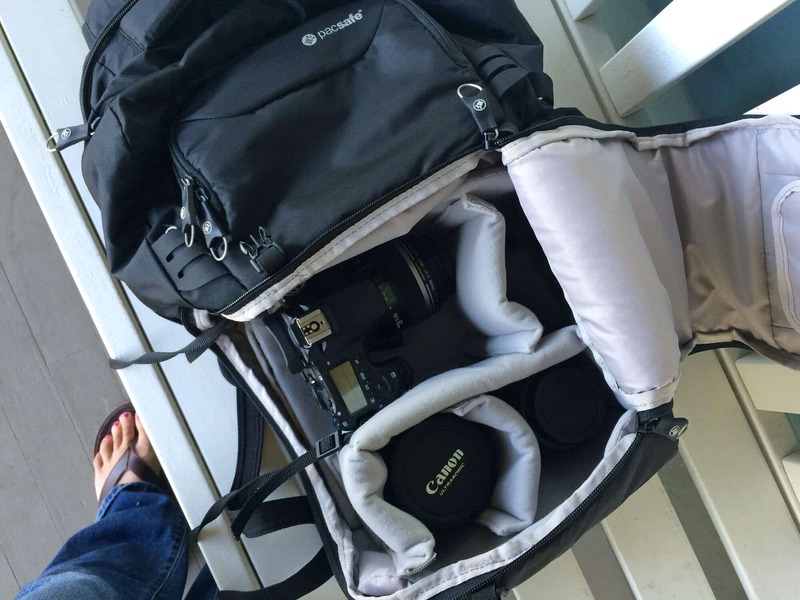 The bag comes with an elastic pocket on the side for a water bottle or small tripod. The V9 is the perfect size to fit a DSLR fitted with a medium-sized lens with two compartments remaining for either two additional lenses or extra batteries, a charger, external flash or other personal items you want to take along. The inner compartments are customizable – you can shift around the velcro pads – to accommodate your preferred layout. The inside of the bag is nicely padded to keep your equipment well protected. The front pouch on the bag (left) has several compartments, including a mesh zippered pouch, to store extra SD cards, batteries, cables, a small notebook or personal items. It also has a RFID safe pocket to protect your credit and ID cards from hacker scanning. The back of the bag (right) has a zippered pocket large enough to fit a 11-inch laptop, iPad, tablet or a thin book and travel documents. An outstanding feature is Pacsafe’s award-winning eXomesh technology. Underneath the fabric the bag has a layer of wire mesh woven through the full length of the front and bottom to prevent bag-slashers from cutting your bag open to spill its contents out. It has wire mesh woven through the front of the bag, the bottom and in the straps, which stops bag-slashers from being able to cut your bag and spill its contents all over the floor. It’s also made with Carrysafe Slashguard Strap, wires inside the straps to prevent cut-and-run theft. Another feature I love is the Smart Zipper Security technology. 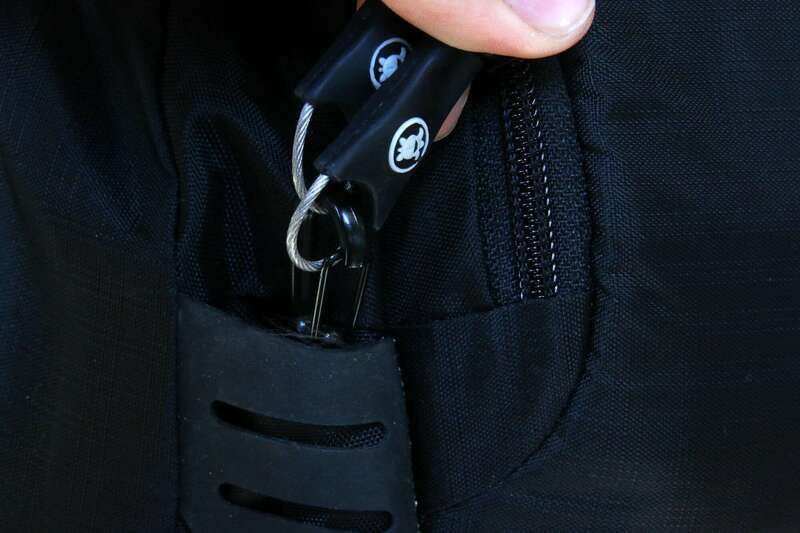 The zippers all have metal wire loops that attach to metal hooks that slip down into a small opening, preventing thieves from being able to grab and unzip. It is such an awesome feeling being able to walk through a busy street or crowded market without having to worry about someone accessing any of the compartments or slash my bag. And with the RFID blocking material inside I can likewise keep my credit card and passport in there without risk. I’ll admit, I tend to be a bit of a packrat when I’m out sightseeing. I can’t stand the thought of not having something I need if I happen to need it, whether it’s an extra lens, other camera accessory or some personal item. I guess it’s probably at least in part because my husband enables that tendency by being so willing to carry my bags for me, ha! 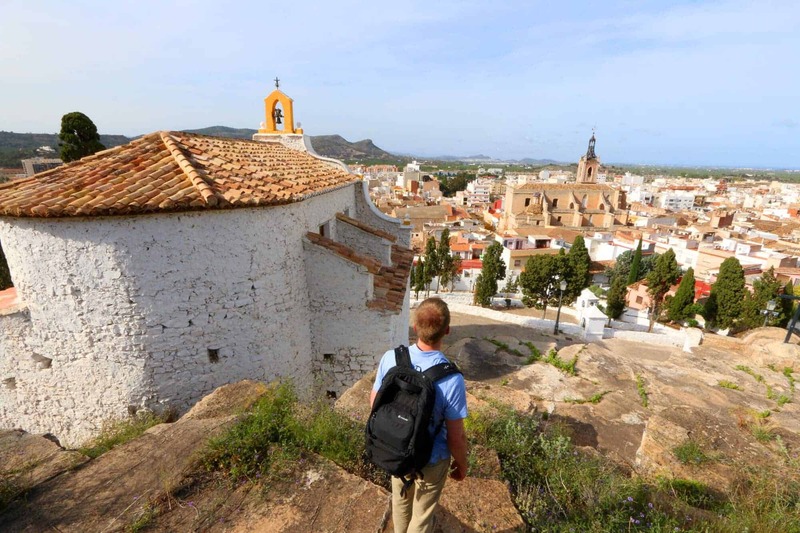 That said, I will say this: On our recent trip to Spain I ended up carrying this backpack a good 80% of the time. For one, it’s by far the most comfortable backpack I’ve carried. And secondly, the anti-theft safety features on it gave me such peace of mind that it actually kind of made carrying the bag enjoyable: Walking through crowded streets I felt totally smug, almost daring anyone to try and attempt anything! 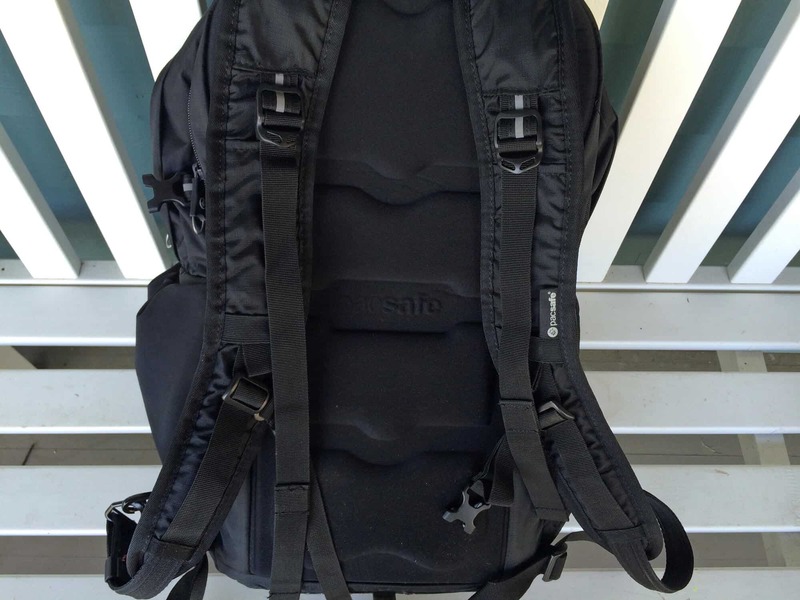 So let’s talk backpacks, specifically the Camsafe V25 Camera Backpack. I loooove this bag. The Camsafe V25 is divided into multiple separate compartments. At the bast is the camera compartment that comfortably holds a DSLR mounted with a lens, two additional lenses and accessories like extra batteries, charger, cables or an external flash. The padding is excellent providing full protection for your camera gear. The Velcro pads inside are modular and can be shifted around to customize the layout according to your preference or they can be removed entirely to create storage space for other larger items. 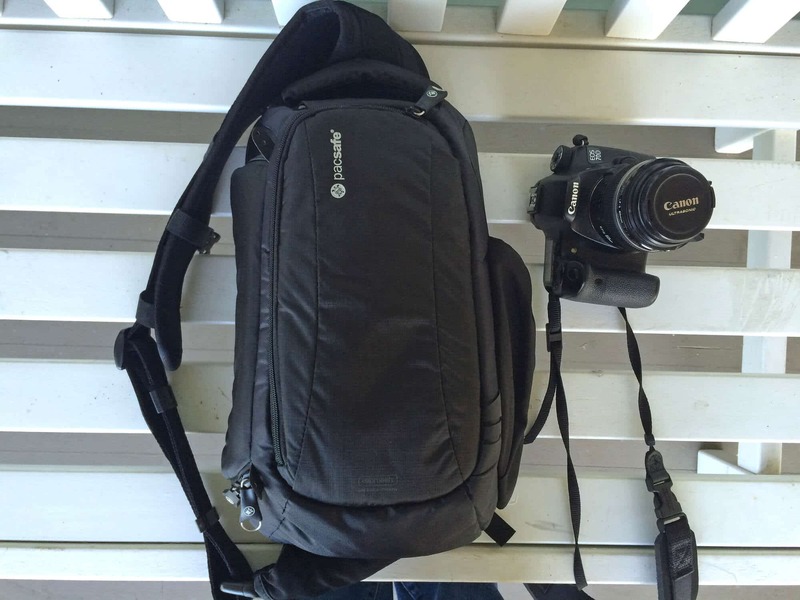 I’ve used this backpack on many occasions for traveling without any camera gear in it. The “sling and shoot” feature enables you to remove one shoulder strap and swing the bag to your side so you can quickly access the various compartments, including the camera compartment, without having to take the backpack off completely. On the inside of the compartment cover is a velcro pouch that’s perfect for extra memory cards. 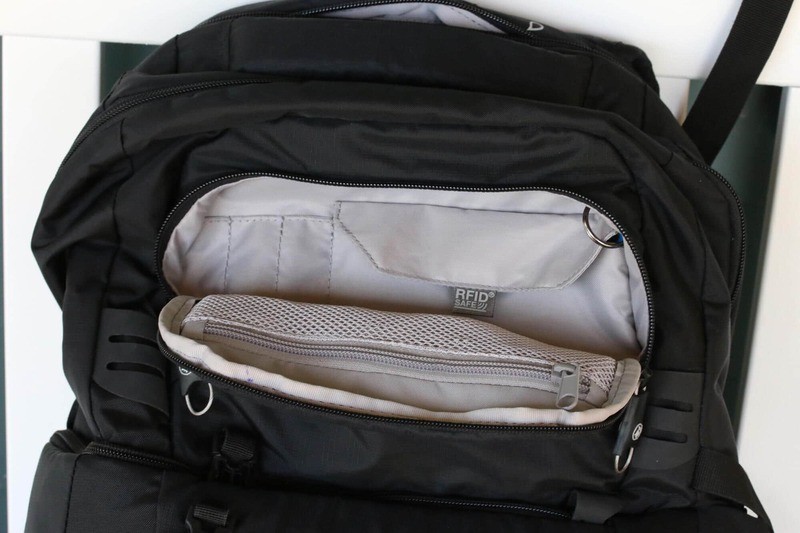 There’s another compartment on the front of the backpack at the top that provides space for small personal items, sunglasses, a notebook, pens, money, credit cards and passports. It also has a RFID safe pocket to protect your credit and ID cards from hacker scanning. 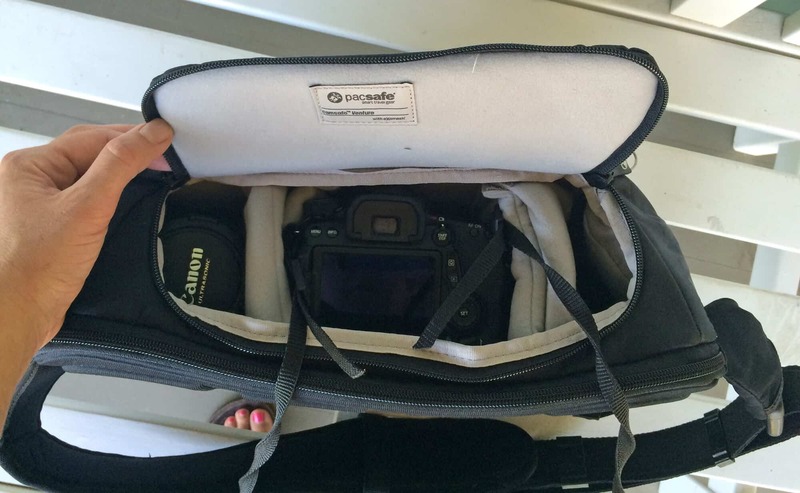 There’s another large compartment (left) at the top of the bag above the camera storage area for larger items. It can be opened up to access the camera compartment below if you want to use the full length of the backpack for storage. 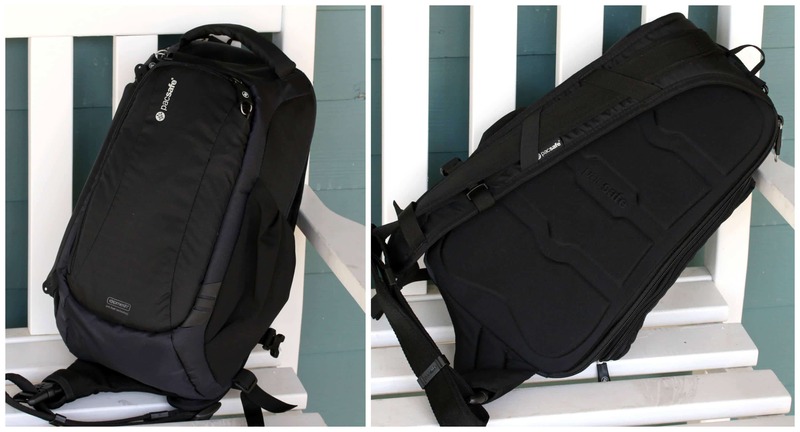 The rear of the backpack (bottom left) has a well-padded/protected zippered sleeve that fits a 15-inch laptop, iPad, tablet, books or travel documents. The outer side of the bag has an elastic pouch for a water bottle or tripod as well as a strap you can use to attach a sweater, jacket or umbrella. The bottom of the backpack (bottom right) has a rain cover that slips in and out easily to protect your backpack from moisture. The padding on the back of the bag and shoulder straps provides for great comfort. I’m not kidding, I had this packed to the gills with over 30 pounds of goods on our flight back from Europe and though the weight put a strain on my back, the padding provided really good comfort and the heavy weight didn’t stress the seams of the bag in the least. Equipped with the same anti-theft technology as the V9 Sling I discussed above, this bag is seriously thief-proof. It features eXomesh technology, a stainless steel mesh that runs throughout the full length of the front and bottom of the bag to prevent anyone from slashing the bag to spill out its contents and the straps have wires in them to prevent cut-and-run thefts. 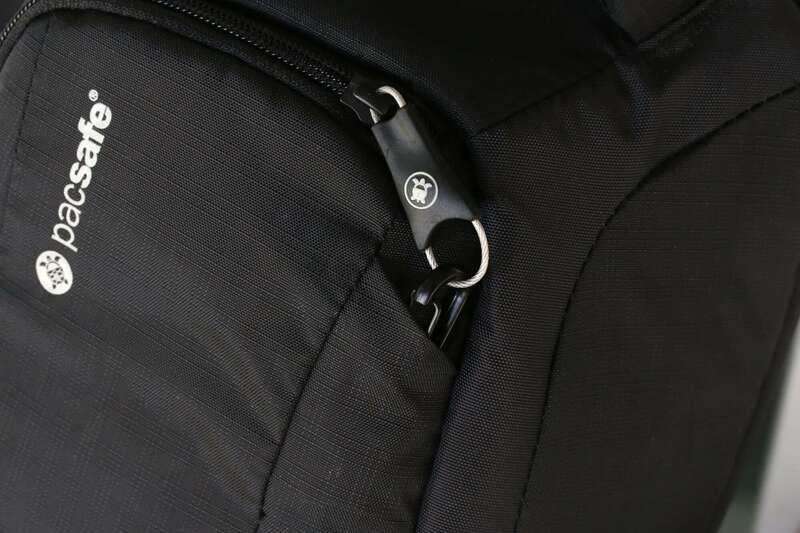 The shoulder straps also have wires in them to prevent them from being cut and that features also allows you to anchor the backpack to a subway chair, for example, to prevent anyone from grabbing your bag and running. It also has the same Smart Zipper Security technology. 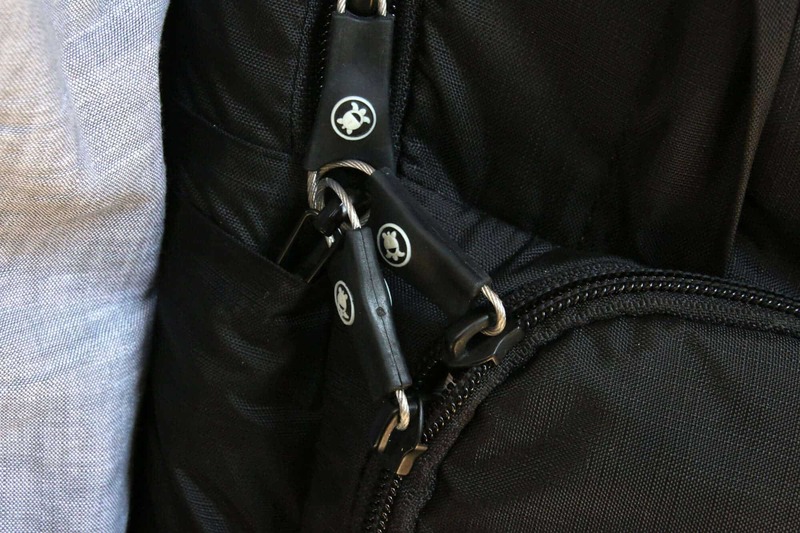 The zippers all have metal wire loops that attach to metal hooks that slip down into a small opening, preventing thieves from being able to grab and unzip. The V25 also has a Turn & Lock Security Hook that enables you to attach the bag to a secure fixture. Again, I cannot say enough about the peace of mind the Pacsafe V25 backpack and my V9 sling give me. Being able to walk down a busy street thronged by hundreds of people or ride a busy subway and not have to worry about anyone being able to unzip or slash my bag, cut my straps, or scan my passport – it’s just incredible. The freedom that peace of mind brings has enabled us to explore and enjoy the journey unencumbered by worry. 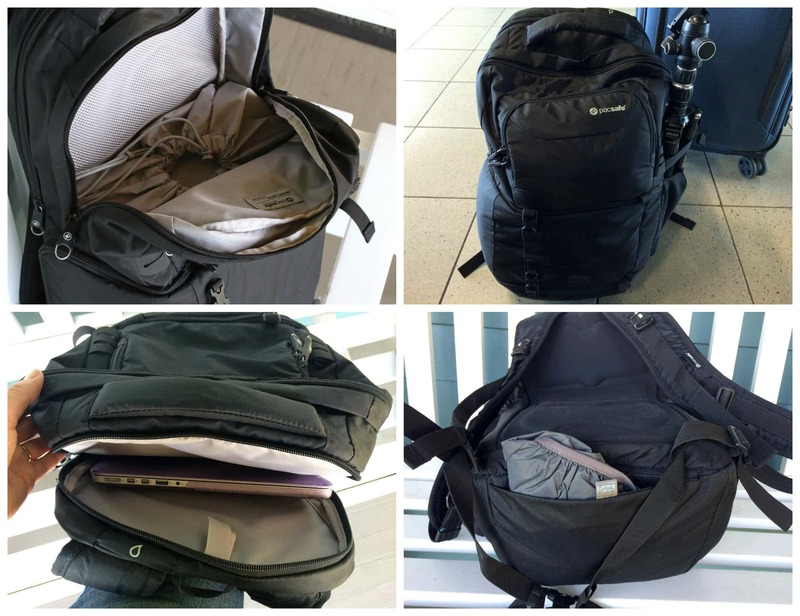 Bottom line: For travel gear that is durable, lightweight, comfortable, with lots of features and state of the art anti-theft technology we highly recommend these awesome products from Pacsafe. Disclosure: I received these items without any obligation to write a positive review. As always, all opinions are entirely my own. « Natural Sweeteners – Which Ones Are Best? These products are great. My brother-in-law used the small pack on their recent trip to Italy and I have my eye on that camera bag, ooh!!! They really are, Debra, I wish I had known about them sooner but sure am glad I do now! These are great tools to use to ensure safety while traveling. Great info! They are, Jocelyn, I can actually focus on the sightseeing without having to give a second thought to the safety of my belongings – that’s priceless! Well I’m impressed wth the bag!! Looks perfect for traveling with a camera and passports! Sturdy and love all the inside pockets too! We travel SOOO much so I definitely have to look into this!! I got my wallet stolen on the subway last time I was in Chicago so now I’m always super paranoid! Oh no, Ashley! That’s exactly what I’m talking about and I am sooooo glad I found Pacsafe, their products ROCK! Awesome tips! One can never be too prepared when traveling. That sling camera bag looks great! No you can’t, Maryanne, and it’s the naive travelers that are always the victims! I’m loving that camera bag. I have a fancy camera purse, but it’s just so awkward to carry around. This backpack looks like a great bag to travel with. AWESOME! I LOVE it, Karyn! It’s light and comfortable and best of all, I don’t have to worry a wink about someone getting into my bag or cutting the straps! We are just planning a trip now, thanks for the tips w/ these products. You’re welcome, Christine, perfect timing! I’m very grateful I’ve never been pickpocketed while traveling! Or from being at home – I live in New York… Great tips! Fortunately I never have either, Julie, and I intend to keep it that way! :) I have friends and family who have though and I’m just so glad I found these awesome products for our upcoming trips. I’ve never heard of these products, but they would’ve come in handy when I was traveling a few summers back! And even now, I know I could make great use out of the Camsafe V9 Anti-Theft Camera Sling Pack. Lugging a camera around can be such a pain sometimes, and it’s so wonderful that there are products to keep your valuables safe as you have travel the world. I agree, Erin, and Pacsafe’s anti-theft technology is A++. These are great!! My sister and Mom just came back from visiting a few countries and these sure would have come in handy! Passing this along, thanks! Your mom and sister will thank you, Colleen, we LOVE these products! That bag is a dream come true! We have been traveling a lot lately and I haven’t found a good camera bag for all my camera lenses and equipment! This looks like everything I have been looking for… Yay! It everything I’VE been looking for, Abeer – you’ll love it! I NEED that camera bag!!! This is such a great post. My daughter is travelling to Sweden next year and I want to make sure she travels safe and secure. Thanks, Kim! Whether it’s the sling for less equipment or the backpack that carries more, your daughter’s gear (and your own) will be safe in these bags. I’m really impressed with both of them. What a great way to have peace of mind while traveling. Where’s the giveaway with the full backpack? LOL. Kidding. Not! Stephanie, I use these even for going places locally. When you’re carrying expensive gear or personal documents you just can’t ever be too safe. So many great travel products here. I’m putting that sling camera bag on my wishlist for Christmas! These are all great options! And I’m the same way about wanting to make sure I have everything I might need when I’m sightseeing. Definitely going to explore these further. I know, Heather, it drives me (and my husband) crazy sometimes, but I just can’t help it :) Pacsafe has a huge range of products – I really want to try one of their purses and larger luggage bags next. Your family will love these, Katerina! 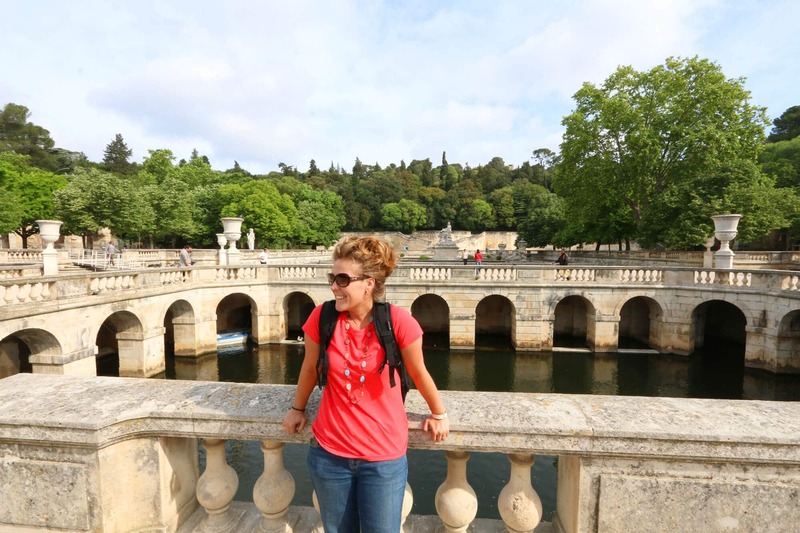 Seriously, nothing is more valuable in traveling than knowing your belongings (and identify!) are safe! I need to find that bag for sure. These are great products! We travel and ton and having the right products make all the difference! It really does, Erin, you’ll love these bags! I know, Kacey, I wish we didn’t have to worry either. Your friends will definitely appreciate the recommendation, Pacsafe’s products are awesome. So many great tips! I love my pac safe! Awesome, Brandy, I’m so glad you have one! 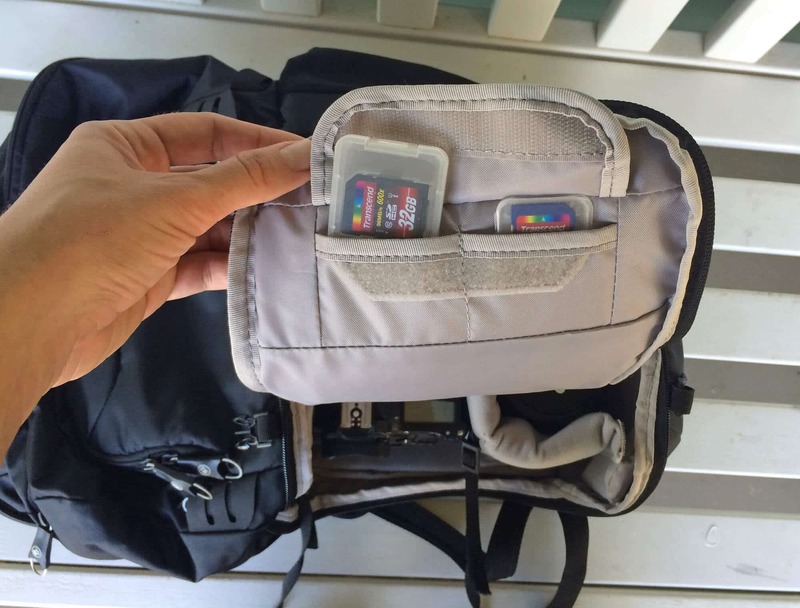 I need to find that camera sling bag and their RFID technology – brilliant! Thank you so much for posting about this company – I need to order this bag soon! These are awesome! They look so convenient and lightweight. They are, Jen, PLUS the incredible anti-theft features! I love that camera bag. I travel a lot and this would be perfect for me!